slumped dramatically, sounding the death knell for the tailfin……. 60 years ago this week, Juan Manuel Fangio won the Buenos Aires Grand Prix held at Buenos Aires in the Autódromo Oscar Alfredo Gálvez [2 February 1958]. 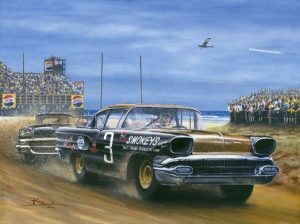 Not one of the four British drivers – Ghorace Gold, Stirling Moss, Peter Collins and Mike Hawthorn managed to complete the race……Paul Goldsmith drove Smokey Yunick’s Pontiac to victory in the last stock car race held on the beach at Daytona, Florida, USA [3 February 1958]…… 50 years ago this week, International introduced its Fleetstar-A-trucks to replace the R and V series [30 January 1968]…….Porsche recorded a 1-2-3 victory in the Daytona 24 Hours [4 February 1968] After the car of Gerhard Mitter had a big crash caused by tyre failure in the banking, his teammate Rolf Stommelen supported Vic Elford/Jochen Neerpasch. When the car of the longtime leaders Jo Siffert/Hans Herrmann dropped to second due to a technical problem, these two also joined the new leaders while continuing with their car. So Porsche managed to put 5 of 8 drivers on the center of the podium, plus Jo Schlesser/Joe Buzzetta on 3rd place, with only Mitter being left out……..40 years ago this week, the Arrows made their Formula 1 debut in the Brazilian Grand Prix in Rio de Janeiro, with the car driven by Riccardo Patrese finishing 9th behind the winning of Carlo Reutemann in his Ferrari [29 January 1978]. Reutemann set the fastest lap of the race on his way to victory, finishing 49 seconds ahead of Emerson Fittipaldi, driving his own car and Niki Lauda in a Brabham……30 years ago this week, a Jaguar XJR-9 driven by Raul Boesel, Martin Brundle and John Nielsen won the legendary Daytona 24 Hour race [31 January 1988]…….. 20 years ago this week, Statutory Off Road Notification (SORN) came into effect in the UK, as the DVLA were concerned that vehicles not taxed were not stored or used on public roads [31 January 1998] Consequently, when a vehicle’s tax runs out and is not renewed or a Tax Disc is returned, the Registered Vehicle Keeper is required to make a Statutory Off Road Notification, that the vehicle is not kept on public roads and the storage arrangements are to be given. 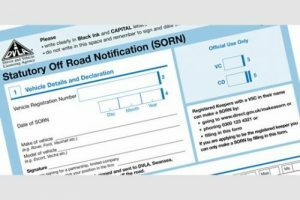 Failing to declare an SORN could result in a £1,000 fine or 3 months imprisonment……. A bad day for Martin Brundle who was rushed to a Miami hospital after his IndyCar smashed into a wall during a practice session at the Homestead Motorsports Complex [1 February 1998]. Fortunately, there was more damage to the car than the driver……Ford employees earned record profit sharing averaging $4,400 [4 February 1998]……. 10 years ago this week, a regular route Chongqing-Shenzhen bus skidded off an icy road packed with snow and fell into a valley at the 98.9 kilometer point of the Guiyang-Zhunyi expressway, on the outskirts of Zhunyi, Guizhou, China, killing 25, another 13 are injured [29 January 2008]……. The following day [30 January 2008] uto giant Ford announced a multi-million dollar investment in South Africa, brushing aside fears about an electricity crisis which had alarmed other international investors…….Bernie Ecclestone launched a remarkable verbal attack on Ron Dennis when asked about the £50 million fine slapped on McLaren as a result of the Spygate scandal [2 February 2008]. “What happened last year has been going on in F1 for years,” Ecclestone said. “If McLaren had come clean and owned up none of it would have happened the way it did. He is a good friend of mine but Ron was six months pregnant and said he was a virgin. He knows he got off cheap.”… on the same day [2 February 2008] South Korean car giant Hyundai Motor Co opened a second plant in India, making the country its biggest foreign manufacturing site.